For a long time at the World Meteorological Organization (WMO) to provide information the Global Telecommunication System (GTS) was used. Now the GTS is moving into to the WMO Information System, which uses modern technology for data management and production of national meteorological services and remote access to data and services. 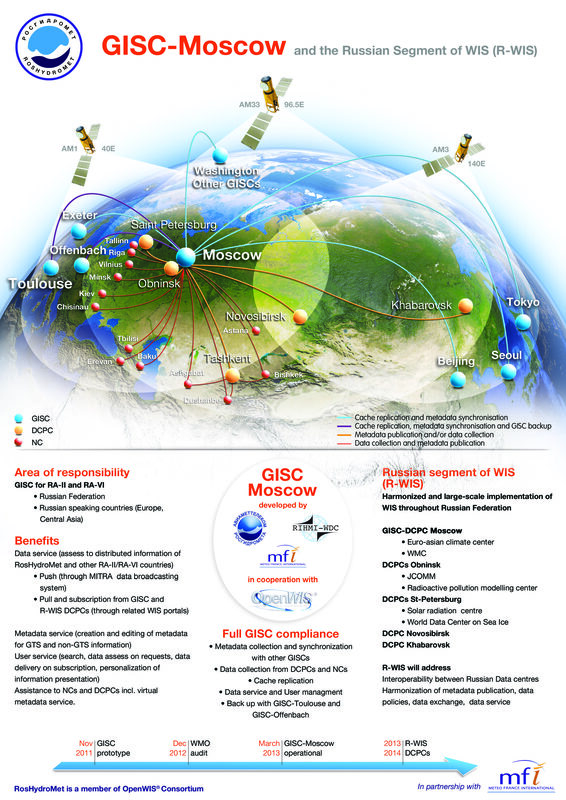 The Russian segment of the WMO Information System (R-WIS) is the "core" of the Integrated information and telecommunication systems for collecting, sharing, delivery and distribution of hydrometeorological information and information about environmental pollution created in Roshydromet, and is designed for the international exchange of information within the WIS. Currently, the main technical solutions of the construction of the WIS-R and the prototype of the data management system were developed. The Global Centre for Information Systems WMO (GISC / GISC - PG "Aviamettelekom") is a major center of R-WIS and has been collecting and disseminating global information structure is defined by WMO, Guide N 9 (including C1), its backup and restore if necessary. GISC is an entry point through the unified portal, users and metadata catalog, for all requests for information, WIS. The portal involved mechanisms for the dissemination of information through subscription and support requests for the data sets specified by the user interactively. Connected to the GISCs data collection and production (DCPC / DCPC - FGBU "RIHMI-WDC" and other designated agency Rosgidromet) responsible for the collection and production of sets of regional or specialized data, forecast products, the other problem-oriented information, as well as its distribution and archiving. National Centres (NC / N - AHEM / CHEM Hydromet) collect and disseminate data at national level, as well as coordinate or authorize the use of the WIS by national users through procedures established by the permanent representative to the WMO. Membership information to the public or confidential metadata recorded in the registration resource center R-WIS data provider. All data coming into the system via the WMO GTS, are public information. Access to public information in the "challenge-response" is provided without any conditions. To disseminate information on subscription required user registration. Register as portal user, specify detailed information about yourself. Using specifal form, justify your need for the role (to provide information about your organization, which is supposed to use the data, etc.). Federal State Budjet Entity "Main Information Technology and Aeronautical Meteorological Services Center of Federal Service for Hydrometeorology and Environmental Monitoring"
Оперативная информация по ситуации в Краснодарском крае и Республике Адыгея на 26.10.2018 г.